Here at Acadia Dental at The Centre Mall, we want our patients to have healthy teeth and gums for life. You already know the importance of brushing, flossing and avoiding sugary foods and beverages for optimal oral hygiene, but you can also improve your oral health by eating the right types of foods. Here are some of the main ways that your diet impacts your oral health. Since each tooth is held in place by bone, our Saskatoon dentists recommend eating foods that are high in calcium to keep the foundation of your teeth strong. Some of the best sources of calcium include yogurt, cheese and fat-free milk. If you are a vegetarian or vegan, you can get a healthy dose of calcium from fortified soy drinks or tofu. Eating foods with phosphorus is another great way to promote stronger, healthier teeth, and you can increase phosphorus levels in your diet by eating more nuts, beans and lean meats. The best kids dentists will tell you about the importance of vitamin C for pediatric dental health, and making a habit of eating more foods that are rich in vitamin C from an early age can be beneficial for life. Vitamin C is known to enhance cellular health and promote the development of stronger gums and other bodily tissue. Strong gums are needed to keep gum disease (gingivitis) from developing. Our Saskatoon dentists emphasize the importance of preventative care to keep teeth and gums healthy. Some foods are known to be effective in preventing certain dental problems. 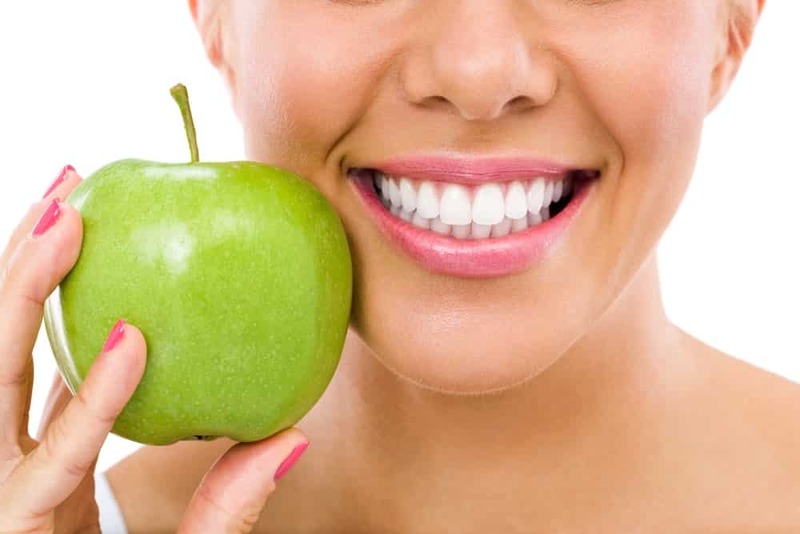 Apples, carrots and other crunchy fruits and vegetables can cause the mouth to produce more saliva and wash away the acids and bacteria that weaken tooth enamel and cause cavities. Even chewing a piece of sugarless gum can promote more salivation and help with oral hygiene. By preventing dental problems, and not moving backwards you will also be a more ideal candidate to make forward steps and receive the best cosmetic dentistry Saskatoon has to offer. Even though eating some crunchy foods can be healthy for the teeth, it is often best to eat softer foods to prevent any chipping or cracks from forming. Pasta, oatmeal and yogurt are just a few of the foods that are gentle on teeth while chewing. Aside from their high sugar content, suckers and lollipops can damage teeth when biting into them. Chomping on ice is never a good idea. By avoiding some of the worst crunchy foods for teeth, you will be less likely to need to undergo tooth extractions, oral surgery or other corrective dental procedures at a dental clinic Saskatoon patients can visit. Kids dentists as well as dentists for adult members of the family who require corrective dental appliances recommend eating certain foods while avoiding others to keep these appliances better intact. Fruit smoothies, tomato soup and mashed potatoes are considered to be among the safest foods for braces and other dental appliances. To ensure that you or your child’s next dental checkup is a success, it is best to not eat hard taco shells, popcorn or pretzels. Sticky or hard chocolate can also be bad for dental appliances. The knowledgeable team members at Acadia Dental at The Centre Mall strive to provide the most comprehensive general dentistry, oral surgery, family dentistry and cosmetic dentistry Saskatoon has to offer. We maintain a dental clinic Saskatoon residents can visit whenever they need dental care. To schedule your next dental checkup, please contact our office today.